What started out as a simple plan to open a bar has, over the years, bloomed, blossomed, spun and spiraled into something bigger. 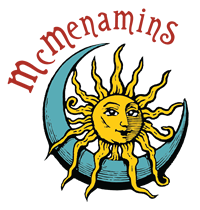 While you can always grab a pint of ale and a burger with friends and family at your neighborhood McMenamins, you can also enjoy a cup of joe, try a spirit on the rocks or uncork a bottle of wine with us. Cheers, friends. Featuring 800 bottles for your choosing. Roasting beans from small-farm growers to produce the best cup of coffee. Heavenly spirits of the highest order. Producing more than 25,000 cases of wine annually and hard cider, too!